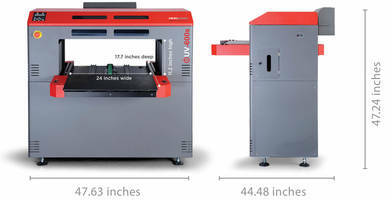 The iUV600s and iUV1200s Printers with Vacuum bed are designed for items that are hard to keep flat. The systems come with LED UV lamps that offer clearance of up to 300 mm. The use of vacuum bed locks down the item to be printed and prevent it from shifting on the bed. The bed helps in eliminating mistakes that are associated with hard to flatten items and deliver consistent print. TAMPA, Fla., Jan. 24, 2019 /PRNewswire/ -- Compress UV, a ColDesi, Inc. company today announced the release of their new vacuum bed made specifically for items that are hard to keep flat. This unique accessory for Compress UV printers handles situations that require high-quality full-color printing on light, thin, curling or heat sensitive materials. "Rolled media, packaging boxes, foam core, and corrugated plastics are all very common substrates that are hard to keep flat," said Don Copeland, Product Manager for Compress UV Printers. "With the release of the new vacuum bed, we solve that problem without tapes or glues," he said. The company sells the vacuum bed as an optional accessory for the Compress iUV600s and iUV1200s. Both machines have dual, long-lasting LED UV Lamps and a wide bed that can provide clearance of up to 300mm (11.8″). Considered some of the fastest small and mid-format LED UV printers in the market, the vacuum bed accessory enhances the product line. It provides a more consistent print, saves time, and helps prevent mistakes with hard to flatten items. Copeland provided a list of common UV printing problems solved by the vacuum bed. Eliminates Tapes or Adhesives – traditional UV printing on items that curl or bend often requires the item to be taped down or mechanically fastened. The vacuum bed eliminates that need. Cleaner Crisper Print –The vacuum bed locks down the item to be printed and keeps it from shifting slightly on the bed and thus creates a more precise print. Saves Time – The Vacuum action of the bed happens automatically once the item is placed on the bed. No need to take extra time to tape down or otherwise secure the item. Adaptable – overlays can be placed on top of the vacuum bed to allow for unique shaped items. No need to purchase an additional bed for each type of item. No need for complicated jigs. As a leader in product customization systems, ColDesi has a long history of providing top-notch training, service, and support for both new and existing businesses. Compress UV supplies high-quality UV printers in the small and mid-format ranges to solve traditional problems with other forms of slow-dry printing.